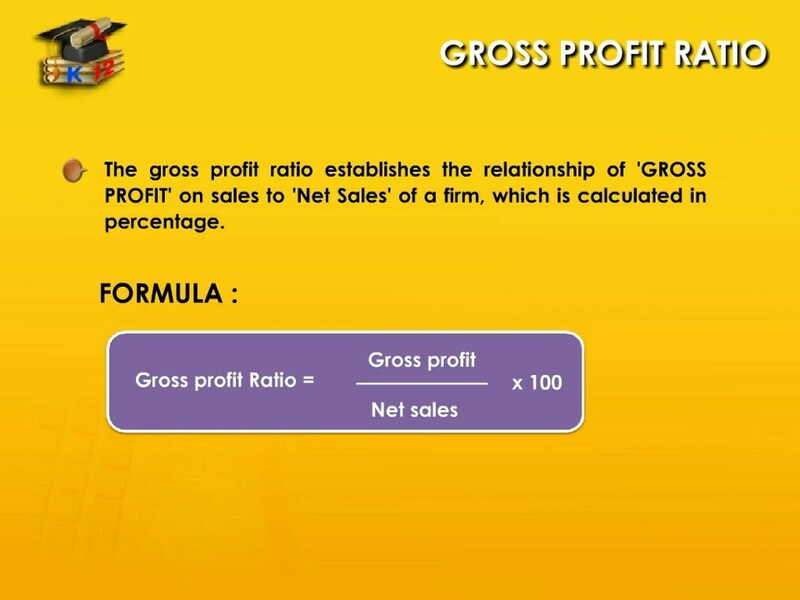 Gross profit ratio (GP ratio) is the ratio of gross profit to net sales expressed as a percentage. It expresses the relationship between gross profit and sales. 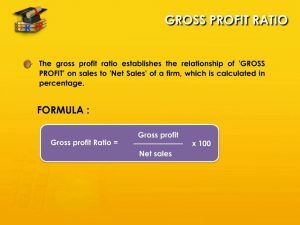 The basic components for the calculation of gross profit ratio are gross profit and net sales.Net sales means that sales minus sales returns. Gross profit would be the difference betweennet sales and cost of goods sold. Cost of goods sold in the case of a trading concern would be equal to opening stock plus purchases, minus closing stock plus all direct expenses relating to purchases. In the case of manufacturing concern, it would be equal to the sum of the cost ofraw materials, wages, direct expenses and all manufacturing expenses. In other words, generally the expenses charged to profit and loss account or operating expenses are excluded from thecalculation of cost of goods sold. Required: Calculate gross profit ratio. Gross profit ratio may be indicated to what extent the selling prices of goods per unit may be reduced without incurring losses on operations. It reflects efficiency with which a firm produces its products. As the gross profit is found by deducting cost of goods sold from net sales, higher the gross profit better it is. There is no standard GP ratio for evaluation. It may vary from business to business. However, the gross profit earned should be sufficient to recover all operating expenses and to build up reserves after paying all fixed interest charges anddividends. It should be observed that an increase in the GP ratio may be due to the following factors. Increase in the selling price of goods sold without any corresponding increase in the cost of goods sold. Decrease in cost of goods sold without corresponding decrease in selling price. Omission of purchase invoices from accounts. Under valuation of opening stock or overvaluation of closing stock. On the other hand, the decrease in the gross profit ratio may be due to the following factors. Decrease in the selling price of goods, without corresponding decrease in the cost of goods sold. Increase in the cost of goods sold without any increase in selling price. Unfavorable purchasing or markup policies. Inability of management to improve sales volume, or omission of sales. Hence, an analysis of gross profit margin should be carried out in the light of the information relating to purchasing, mark-ups and markdowns, credit and collections as well as merchandising policies.